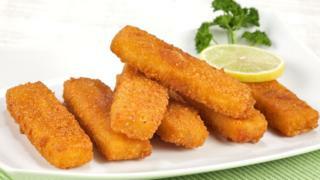 Image caption Is Slovakia getting less fish in its imported fish fingers? Laying out three products, Prime Minister Robert Fico has said it is time Slovaks get the right to the same quality of food as other Europeans. Why was it that the same brand of fish fingers had more fish in neighbouring Austria, he asked. Mr Fico said it was a serious problem that he would raise with Czech, Polish and Hungarian leaders on Wednesday. If the European Commission fails to act, he has threatened import restrictions from other EU countries. "We have to defend ourselves, we can't accept this," he said on Tuesday, describing the issue as a scandal. Alongside the fish fingers lay packets of fabric softener and coffee. Any boycott of products from another EU member state would violate competition rules but the Slovak leader said he would be compelled to act if the Commission did not. As a last resort, he would consider a citizens' initiative of a million signatures. A senior EU official said this week she would do all she could to fight against a "double-standard market". Mr Fico's complaints about food quality chime across the four Visegrad states in Central Europe. Earlier this year Czech Agriculture Minister Marian Jurecka told the BBC that one brand of iced tea sold in Germany had 40% more tea extract than the same sold in the Czech market. He made a similar complaint about lunch meat. Hungary's food safety authority, Nebih, found earlier this year that a chocolate spread and a packet of wafers were of a different quality to those sold in Austria. Polish business website Gazeta Prawna even asked whether it was a case of "food racism". While companies are free to sell food with different ingredients if they are correctly labelled, more importantly they are also required to be fair to consumers under EU rules. A European Commission spokesman said the evidence so far suggested there was no systematic attempt by producers and retailers to vary food quality for different states. The problem was limited to certain products, he told the BBC. EU Justice Commissioner Vera Jourova said on Monday she would start a dialogue with producers and retailers as many people felt they were being treated as second-class consumers. "We need to join forces to tackle this problem that appears to be present only in some EU countries," she said.